My kids love this book. And I'm not saying that's because our house is so full of books that they are used to prop up furniture. (Said books may be under the furniture and on it, but they are not being used to prop anything. That would break the spines.) The story is familiar and that's why we all like it. Books are everywhere in our house and I intend that they remain so. 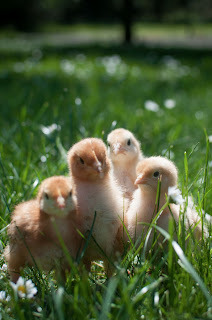 They aren't this small anymore and we added two additional chicks after taking this picture. Now we have a total of 6 "baby chickies". Also, Miss Bunches has been renamed "Nellie" (yes, Olsen) because she was getting kind of mean for a bit. One of the new chickens was dubbed Happy Bunches in her place (not pictured) and the littles gal amongst them is named Rosie (also not pictured). It should be noted that chickens really are as big and stinky as everyone says which, upon some reflection, might be the reason that the family in this book got rid of all of their books. Chickens can only co-exist with other things for a brief period of time and then no more. At any rate, we love our chickens (who are about to move outdoors for good! oh yay!) 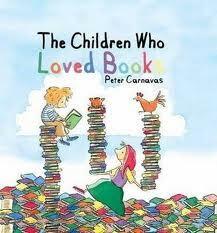 and our books, making The Children Who Loved Books a hit in our household! Note: this title is not available through Amazon. It was released earlier this year and is available through Usborne Books & More which is where I have linked the title to. Many thanks to Kane Miller who sent a copy of this title my direction in exchange for my honest thoughts. Mu husband has always wanted to raise chickens. If he ever gets them I hope he takes on their full care. ;-) I don't know if I'd want to raise them, but I do really like fresh eggs. I have a special relationship with the library as a privileged patron. I normally return books on time, but if I forget, they let me continue to check out books in exchange for a small contribution to their operating fund. I'm curious why you chose to get chicks. I find it relaxing just to be in our home library, breathing the air - it's even better while reading. But I really appreciate having a public library as well, particularly for the non-fiction that I will likely read only once. I like having a large personal library (and I especially would with children around), but I do really enjoy using the public library.